It snuck up on me, but we have a lot of Samuel Beckett in the shop. None of it’s signed by the man himself, so perhaps I gave it short shrift. As I catalogued it, I realized that I know so little of his work. Just as Fitzgerald’s work suffers because so many are made to read Gatsby at a tender age, so too does Beckett’s oeuvre suffer from Godot-fatigue. Some of it is grand, some humble. Grandest of all, probably, is Beckett’s first appearance in print — at twenty-three, oy vey — in Our Exagmination Round His Factification for Incamination of Work in Progress with Letters of Protest by G. V. L. Slingsby and Vladimir Dixon (Paris: Shakespeare and Company, 1929). Beckett’s is the first contribution in the collection, entitled “Dante… Bruno. Vico.. Joyce” [sic, and often “corrected”]. It shows a twenty-three-year-old (oy vey) deep in thrall to James Joyce, for whom Sylvia Beach put the Exagmination together. He finds in Joyce’s published work broadly, and in Finnegans Wake in particular, a strong whiff of the thinking of the Enlightenment philosopher Giambattista Vico. Beckett shows himself very much the precoque, the alumnus of Trinity College, Dublin, the English lecturer at the Ecole Normale Supérieur. His erudition is perhaps never again so bald. From 1929 we have a silence through the thirties, attenuated by the first American edition (New York: Grove press, 1957) of his first novel, Murphy (orig. London: Routledge, 1938). It is our first flash of Beckett’s sardony. Take for example a passage selected at random: “Miss Dew was now experimenting with quite a new technique. This consisted in placing her offering on the ground and withdrawing to a discreet remove, so that the sheep might separate in their minds, if that was what they wanted, the ideas of the giver and the gift” (101). It’s drily funny, and deeply sensitive to what would later be called mentality; even though this is narrative, Miss Dew’s view and voice are communicated. The form is recognizable enough, but the take on the peculiarity — not yet absurdity — of human behavior in the late interwar years is reminiscent of Waugh’s Scoop, which came out in the same year. 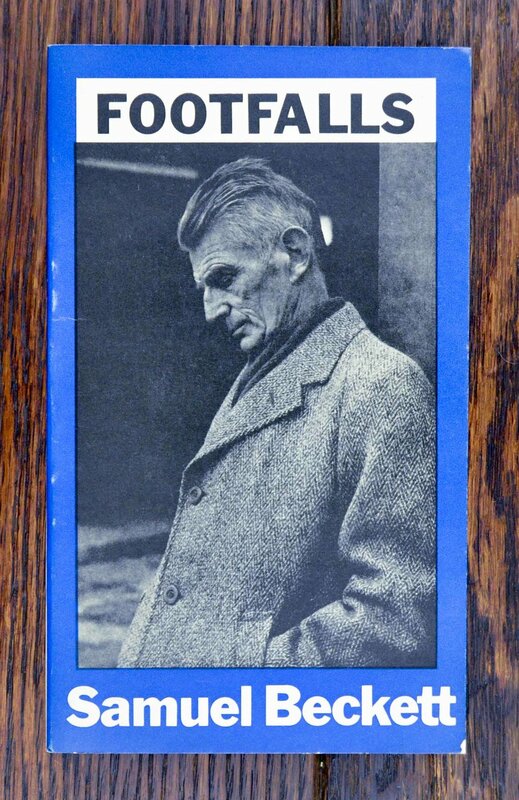 After the success of Godot (1953), Beckett had a wide berth with publishers; people would see (and perhaps buy) avant-garde fiction — plays and prose. Calder and Boyars and Faber and Faber served, perhaps somewhat grittingly, as the disseminators of his work in England. The prices of their books — Faber’s Play (1964) was 9/6-, Calder’s Imagination Dead Imagine (1965) was 8/6- for a mere fourteen pages in card wraps — were astoundingly high. One cannot imagine that the print runs were large. But this is not a musing about print-runs (must it be about anything? Surely Beckett wouldn’t mind.) but about Beckett as an engine of the avant-garde. Not only did his publishers — Grove sold his work in America — struggle with the appeal of the work, but with the work itself. Take, for example, his 1976 Footfalls, which is as much a work of choreography as it is of theater. Mounted in honor of his own seventieth birthday, it is much more eccentric typographically and prosaically than his earlier work. What becomes clear, indeed, as one leafs through Beckett’s work, is the extent to which he succeeded in stepping out of the Joycean avant-garde and into his own; the advance-guard cannot embrace the rear-guard. The sheer joy in wordplay — which often thrums through the early work; one thinks of course of Love’s Labours Lost — so clearly visible in Godot, is eclipsed by the choreographic possibility of the “script”. This is nowhere clearer, perhaps, than in the assemblage of pieces under the title of Eh Joe & Other Writings (Faber, 1967). From Act Without Words II. Eh Joe (originally broadcast on BBC television in 1966) is the most verbal of the pieces, but as the original voice of the woman, Nancy Illig, describes, “the voice becomes a technical device, on a par with the dolly”. Beckett sought monotony and quiet, almost a dissolution of the words rather than the sparkling precision demanded in earlier works. The other writings are Act Without Words II and Film, both without dialogue. They recall nothing so much as the guideline-art (or rule-art) of Sol LeWitt, which began in 1968; LeWitt illustrated a piece by Beckett in Harper’s Bazaar in 1969. If a play is typically a dialogue between its author and its performers, Act Without Words II and Film are rather dialogues between Beckett and the technical staff — grips and dollies, director and cinematographer and stagehand. Here Beckett is very much the creator of “performance” rather than “drama” per se; not a new or even a particularly controversial claim, but in the context of his written output, it is, hopefully, an interesting rhetorical exercise. The relationship between books and performance art is rich and fruitful but it is often more documentary than instructional. Since Beckett himself never performed (that I know of; I’d be fascinated to know of exceptions) he needed a means of conveying his conceptions to others. As such, he will perhaps irrevocably be thought a playwright (inter alia), but the term is very much too narrow to be accurate. 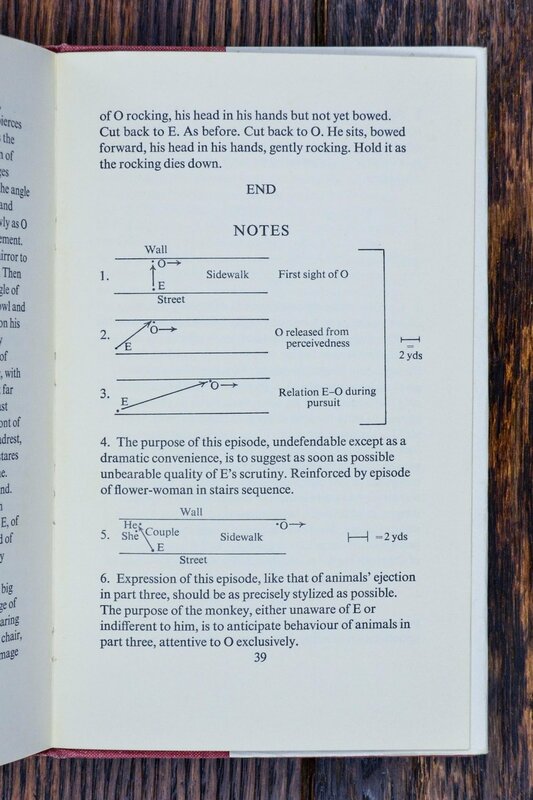 To close, the “resolution” of a “mystery.” Legendarily, Beckett had at the same time as Godot another play ready to mount: Eleuthéria (written as early as 1946). Godot was simpler to mount, and so was more appealing to Roger Blin, who directed the première. Over time, Beckett came somewhat to disdain Eleuthéria (“Freedom” in Greek), and buried it. 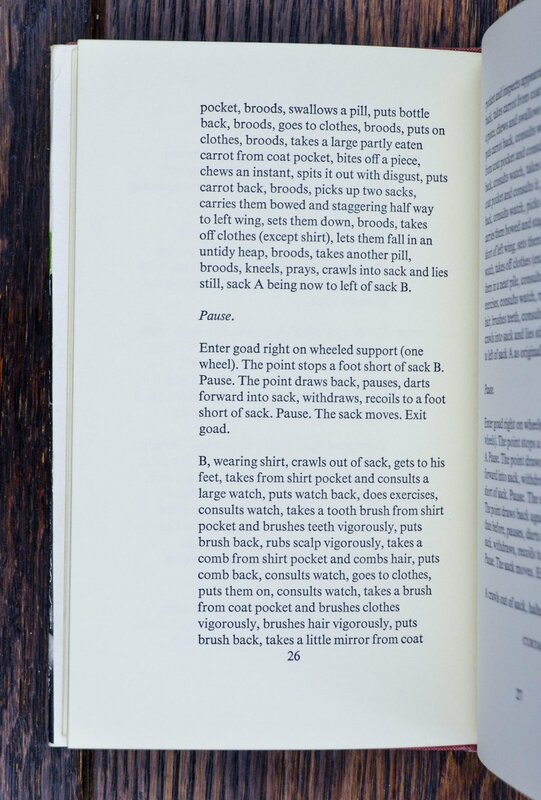 In 1985, Barney Rosset, the legendary publisher at Grove Press (which nearly exclusively printed Beckett’s work in America), was pushed out; Beckett offered to allow him to publish the text — in a new English translation — as a gesture of kindness, but then balked. Rosset held off, but when Beckett died in 1989, he began to pursue the project anew. Well, no bookseller that I know of (including my benevolent and all-knowing employer, Mr. D. Johnson) could figure out the other two signers’ identities. I wrote to Professor Stanley Gontarski, the leading expert on Beckett, who provided the introduction to the volume, whether his was one of the signatures. Very kindly and rapidly, he replied in the negative but forwarded my query to Mr. Oakes, now publisher of OR Books, who confirmed: “the three signatures are Barney Rosset… myself, and Dan Simon, then the co-publisher of Foxrock and now publisher of Seven Stories Press.” There we have it!